Dried Cranberry Sugar Glazed Pecan Holiday Salad is the ONE and ONLY salad you will need for the holiday season. Sweet, savory, fruity, crunchy and a gorgeous centerpiece. 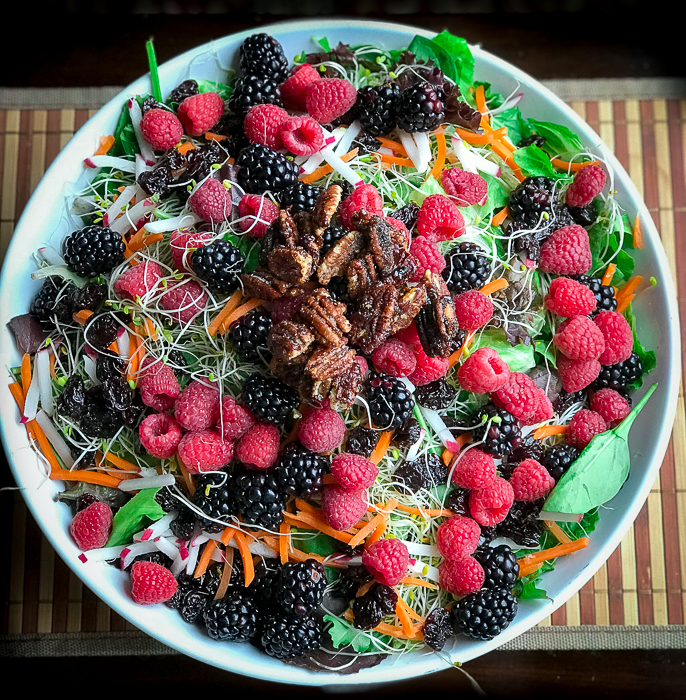 You can be both naughty (eat delicious food) and be nice (eat healthy food) this holiday season with this delightful Dried Cranberry, Sugar Glazed Pecan Holiday Salad. 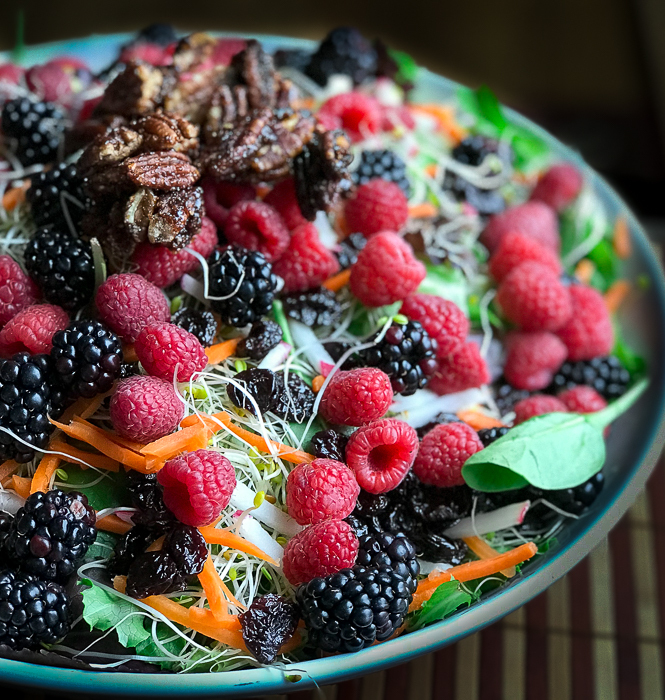 With a combination of crisp healthy greens and dried fruit to combat the naughty sugar glazed pecans and blue cheese, it is the perfectly balanced salad. Dried Cranberry Sugar Glazed Pecan Holiday Salad is also a very festive for the holiday season with the beautiful green and red colors of the salad as a back drop for the cinnamon sugar pecans. Drizzling the salad with either the homemade citrus dressing or cranberry dressing just kicks up the entire experience. 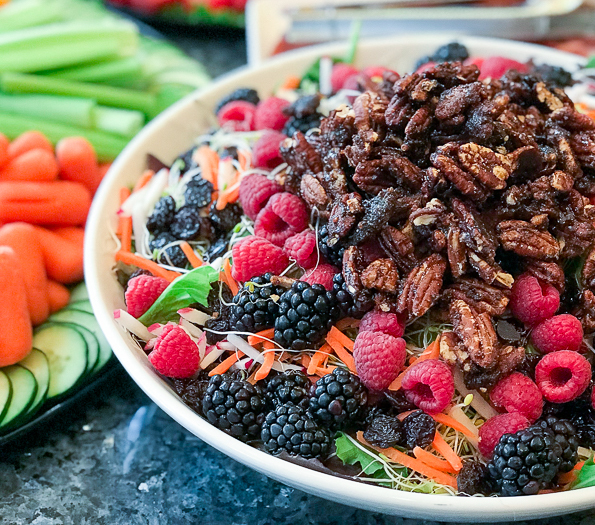 Dried Cranberry Sugar Glazed Pecan Holiday Salad is a fantastic salad to bring for a dish to pass as you can set it up like a salad bar with a big bowl of fresh greens and then have separate bowls of dried cranberries, sugar glazed pecans, blue cheese and the dressings on the side. Friends, family and kids can make their salads just the way they like it. The sugar and cinnamon glazed pecan are a very yummy festive snack, just all by themselves. In less than 5 minutes, you can have them from stovetop to mouth and trust me you will wish you made more. They can be stored for a couple of weeks in a Tupperware or sealed baggie. In moist and humid Hong Kong, they may only last about 5 days in storage. Do you ever dread having to bring a dish to pass for an event? Dried Cranberry Sugar Glazed Pecan Holiday Salad is easy to throw together and will be the hit of the party. We like to serve the blue cheese and salad dressing on the side and let the guests help themselves. We make our sugar glazed pecans right on the stove top. The addition of cinnamon, sugar, a pinch of salt and kick of chili is just what you need to bring this nut to the next level. They are completely addictive. You can use a sugar alternative, but you will need to adjust the sweetness level to your liking as each type of sweetener is different. We actually used Korean dried chili ground for this recipe but a dash of dried red chili flakes also works well. Adjust the spice to your desired heat level. If you are looking for some fun and interesting Holiday mains be sure to read our Top 10 Holiday Dinner Ideas. 1 Sugar Glazed Pecans - In a large frying pan add pecans, sugar or sugar alternative, cinnamon, hot pepper flakes and salt and cook over medium heat until the sugar is all melted and pecans are crispy. Stir gently and frequently and watch them closely so they do not burn. Place sugared cinnamon pecan on parchment paper to cool and rinse your spoon and pan immediately as this forms a candy at this stage. 2Cranberry Dressing - in a blender add cranberries, orange, sugar or sugar alternative, red wine vinegar, salt grated onion and olive oil and blend until smooth. Set aside. 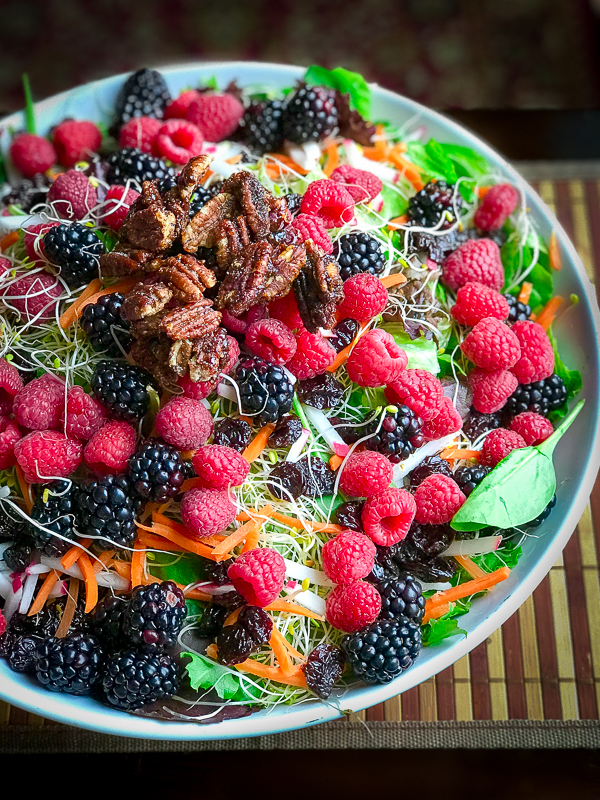 3Assemble the Dried Cranberry Sugar Glazed Pecan Holiday Salad - Place washed greens into a large salad bowl and garnish with dried cranberries, carrots, radish, alfalfa sprouts, crumbled blue and sugar glazed pecans. Dress with cranberry dressing. 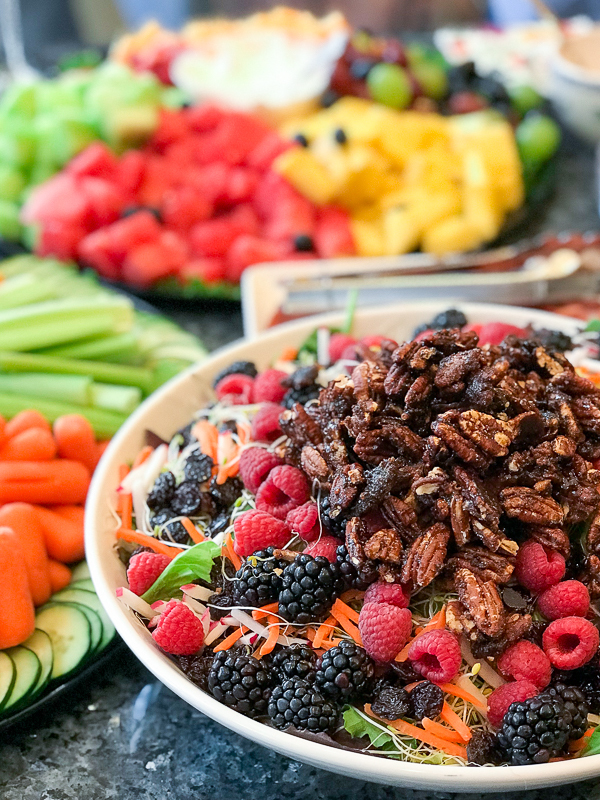 You can also set up as a salad bar with the greens in a large bowl and all of the topping in separate bowls and let everyone help themselves. Enjoy!